Mediterranean Chicken Flatbread - chicken, red pepper, olives, pepperoncini peppers topped with Sargento Shredded 6 Cheese Italian blend. SO good and easy! Sargento is excited to host a “Chopped at Home” contest. Do you watch Chopped on Food Network? We love it! I am always amazed at what the chefs create with some crazy ingredient combinations. Sargento challenged me to make a fun dish with Chicken, Greek Yogurt, Red Bell Pepper and Sargento® Chef Blends® Shredded 6 Cheese Italian. Chicken Legs and I brainstormed, and he came up with this yummy Mediterranean Chicken Flatbread. We mixed the Greek yogurt into the pizza sauce. It made the sauce really good and creamy. I would definitely use it again! 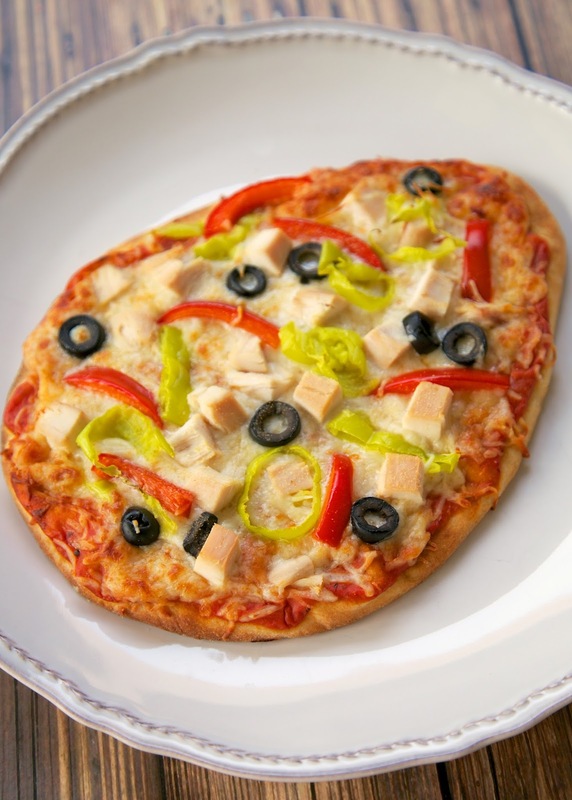 We topped the flatbread with the Sargento® Chef Blends® Shredded 6 Cheese Italian, chicken, red peppers, black olives and pepperoncini peppers. It was SO good! I loved the 6 Cheese Italian blend. It had mozzarella, smoked provolone, romano, fontina, asiago and parmesan cheese. All of my favorites in one! Now it’s your turn! You can enter the Chopped at Home contest for a chance to win $10,000! 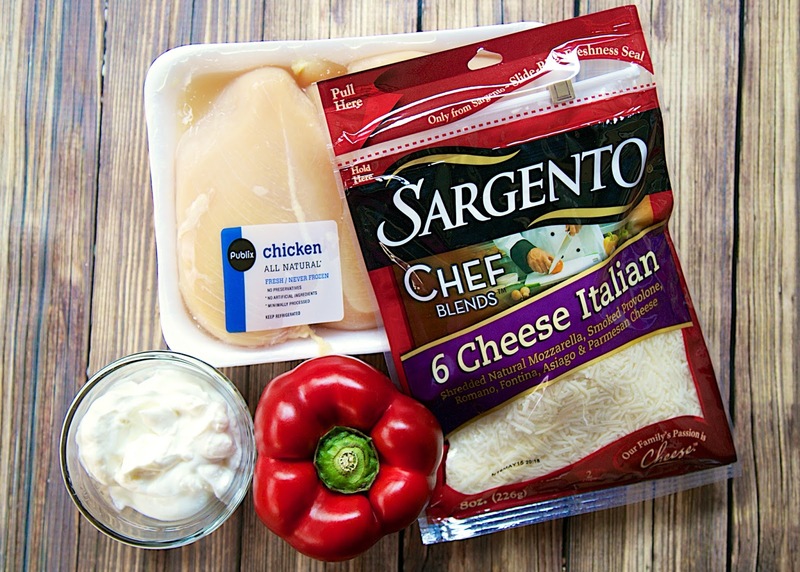 All you need is Sargento® Chef Blends™ Shredded 6 Cheese Italian, boneless, skinless chicken breasts, red bell pepper, Greek yogurt, and some creativity to get entered. Mix together pizza sauce and Greek yogurt. Spread on top of naan flatbread. Sprinkle cheese on top of sauce. 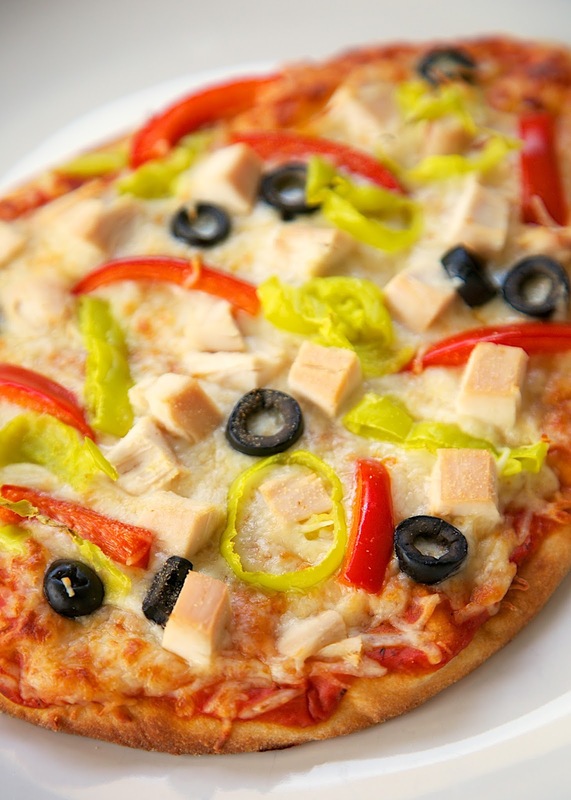 Top cheese with chicken, red pepper, olives and pepperoncini peppers. Bake for 10-15 minutes, until cheese is melted.